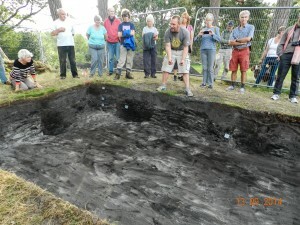 It is our aim to ensure that the local community are kept informed about what is happening on the Heath and for those who wish to have a role in the excavations, can do so. Local schools will be given the opportunity to take part in on-site tours and workshops led by museum staff and supported by archaeologists and volunteers that will give pupils the opportunity have a go at excavating, learn more about flint tools, investigate the different kinds of barrows and explore different archaeological finds. They will also have the chance to look around the site and see what exciting work is taking place. 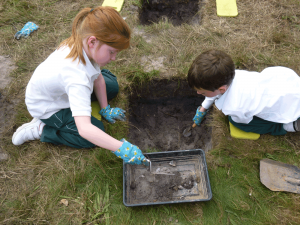 This on-site learning can also be supported in the classroom with resources from the Museum, such as our archaeology resource box, or talks given in school by museum staff. There will also be daily tours of the site, open to the general public, on Tuesdays – Saturdays during the excavations at 4:30. These walks, which will be led by one of the archaeologists leading the project, will look at the excavations taking place and the project as a whole. For more information on how you or your school can get involved please contact Ryan Watts, education and outreach officer, on 01730 260756 or e-mail education@petersfieldmuseum.co.uk.